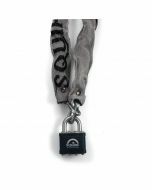 Chain attachments are a convenient and low cost way to secure a padlock whilst it is not in use. They are particularly useful when there are multiple users of the same padlock. All chain attachments are available as part of the Special Products Service. Stronglock Pin TumblerSteel - The rugged range of double deadlocking and ball-locking pin tumbler laminated steel padlocks deliver premium quality performance and an excellent choice of standard shackle, long shackle and closed shackle versions. They are available keyed alike and masterkeyed.